I upgraded my EVGA 1080 FTW1 to a 1080Ti SC2 and I can't stand the new iCX cooler. I understand what EVGA was trying to do, but honestly the whole asynchronous fans thing is more trouble than it's worth. First thing, we are now forced to use EVGA Precision (Pro tip : it's garbage) because MSI Afterburner does not support async fans. Second, trying to synchronise the fans via a custom curve in Precision is almost impossible due to the very different temperature delta between GPU and POWER. Third, the only way to sync both fans is to have them MANUALY set to a certain percentage, and switch between profiles when you don't want your fans at 60% when browsing reddit. Not very convenient. The problem here is that depending on your case's airflow and GPU workload, the GPU fan will often kick to 2000+ RPM while the power fan stays at 0. Then when the power fan comes on you're stuck with uneven noise, vibrations and harmonics caused by both fans running at wildly different RPM. Do you know why twin engine turbo-propeller airplanes have a system called a PROPELLER SYNC ? Because when both props run at even a slight RPM difference it creates annoying vibrations and harmonics, and it is annoying for the passengers. That's why not having the option to synchronise both fans is a bad idea. I would rather have both fans run at a slightly less quiet synchronised speed then have to deal with the uneven noise and vibrations created by the async fans. Adding an option in Precision to sync POWER fan to GPU fan would solve the problem. Moving thread to the evga software subsection. Don't understand the problem here.. just sync all fans in pxoc and make a custom fan curve for the gpu fan. Have it at whatever you want till 40-50c and set that to raise it to whatever you want when the card is playing games when it will heat up. So 30% fan at 30c. Highlight the letter G so it's blue under the fan. Then all fans will sync with the gpu fan. Just make sure the chain icon next to ea fan is connected and not broken so it's linked together. There is a link on the website dedicated to suggestions. Suggestions should go through that link as well as being posted on the forums. When an official suggestion is submitted, it is reviewed. When posted on the forums, which are user based, it may get missed. If you want choices to change the colors due to vision problems, submit that as a suggestion because it will probably help others as well. The suggestion given to you is to link the fans with the fan link, not only does the fan bind change to blue, it also shows the chain link which can help with identification of there is a blue vision deficiency. Yes, it links the cards together for user control. Hopefully evga can add this to work strictly on gpu temperature, but for now, link the fans and set up a custom fan curve as suggested and see if maybe that will help. My cards are founders, and the fans were removed in favor of watercooling, so I can only speak through others experiences. Also, en chroma makes some amazing glasses that can assist with that as well. That isn’t to take a jab at anyone, but if you are going to bring it up, there is help for that medical condition. I run the aggressive fan profile in PXOC, and my three fans seem to run pretty close together throughout my gaming. Then simply click the curve button to bring up the settings window/fan menu & modify only the gpu fan curve while leaving the power & memory curves at default. After setting up your gpu fan curve how you want it click the ok button inside the fan menu then close the settings window. Now click apply on the main ui. All fans should now sync up. Thanks for the detailed answer man. I tried and double checked everything. No matter what I do, the power fan will either be on its default bios curve, or on its own custom curve. It won't ignore the power custom curve and sync with the GPU curve. Could it be a bug with the SC2 iCX cooler ? As soon as I hit OK on the fan menu both fans will run according to their custom curves no matter what the "link" button is set at. I still believe the only thing the link button does is link the UI sliders and not the actual fans.... You are positive all your fans run at a similar percentage under load ? It appears the g,p,m links only apply to manual mode. Anyway, is there still no fix/improvement of this feature 1 year+ later? Also following this pattern, it's obvious that GPU generates more heat on nearly all cards and the GPU fan will wear off faster than the other one. I can see and feel these fans are way way better and more solid than regular fans of 90% of other cards, but still they will eventually wear off at some point. No solution to this as far as I know. I had to resort to switch between auto and manual 60% fans every time I launch a game or come back to my desktop. Otherwise on auto curve my power fan will stay at 0 RPM for half an hour and suddenly spike to 2000 RPM when the the card heats up. And leaving both fans on manual at 60% is annoying when doing windows stuff. Honestly I can’t believe I have to do this in 2019 , for all the praise EVGA gets, having to use their software and being unable to control my fans how I want it is a big no go for me. I will not deal with this manual fan speed switching non sense with my next card, trust me. Well, I don't have the "spike" scenario over here and I really like everything else about these cards, but that imperfect fan RPM just bugs the **** out of me. I will for sure leave it at the curve setting and just try to ignore it, but still. I don't believe that nobody had the idea to allow syncing all 2/3 fans RMP to 1 curve and also having the option to always follow the highest temperature curve for extra safety/cooling or whatever reason. Just more options, customers like these. Btw about the spiking situation you've got there. There might be something wrong with a temp sensor. You might wanna try everything on stock and see if it still happens. 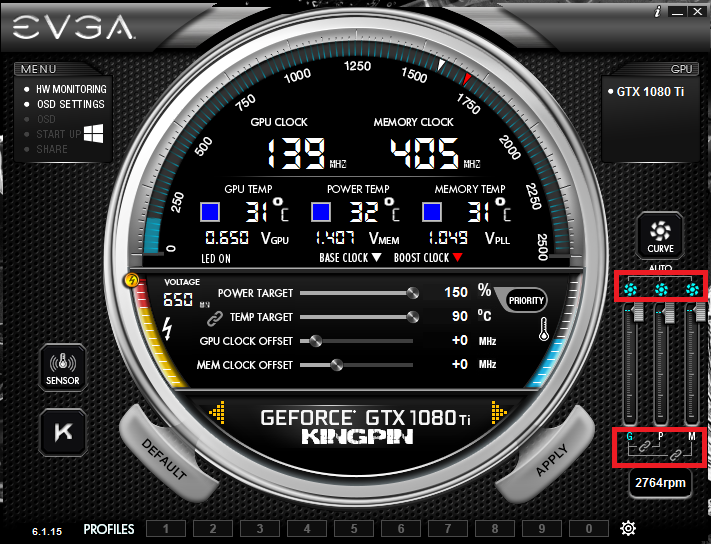 Use stock bios/precision settings and see if it happens, also pay attention to temp monitor. If you've got faulty sensor, you should consider an RMA, which I've done with 970 some time ago and they entirely replaced my FTW for a FTW+ for free, it was very very minor issue, not even noticable by most people, I'm just that picky and paying attention to details and stuff. Anyway I'm glad I did, that's one of the reasons I still stick with EVGA.